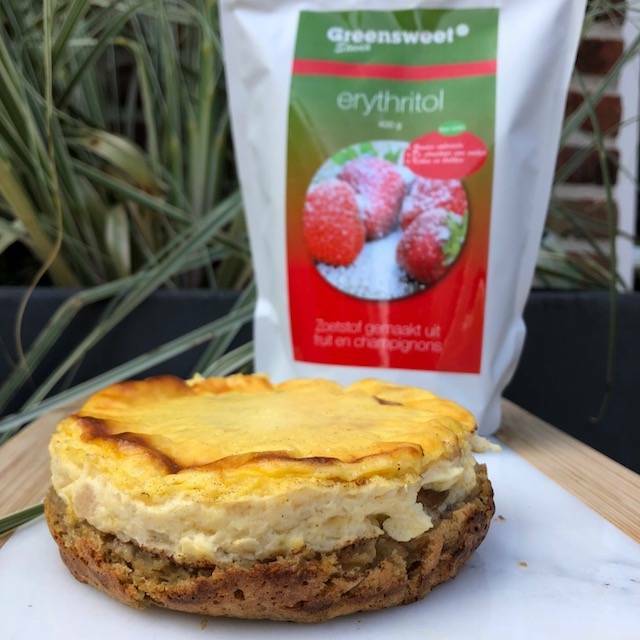 A recipe from FoodForFemke in which she has processed Greensweet Erythritol. Make oatmeal flour from the oatmeal, you do this by grinding oatmeal in a food processor. Mix the apple sauce with the oatmeal in a bowl. Cover a 12 cm spring form with parchment paper and pour the applesauce-oatmeal mixture into it, press the batter with the back of a spoon. Now you are going to make the custard layer, mix the curd cheese, custard powder and possibly erythritol or another sweetener. Pour this mixture over the applesauce-oatmeal mixture. Put the tartlet in the oven for about 50 minutes. Now you can enjoy this delicious oat custard tartlet! Tip: top off your cake with a warm apple, raisins and some cinnamon.